Uncover your strengths & focus on what matters most. We’re all subject to change – in life and work. Some changes are welcome, some are not. Some are planned, and some are just happenstance. 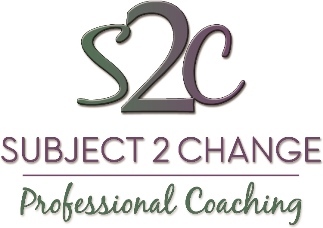 When change is a constant in our lives, working with a “Certified Professional Coach” keeps you in control of your destiny and able to manage those changes, or to make new ones. Are you wondering what a Professional Coach can do for you? A coach works with you to identify and clarify your goals, both personal and professional. And helps you to map out your own path towards achieving these goals, staying with you as a guide for as long as you need support. Certified Professional Coaches are not therapists. They take time to understand you – your focus and motivations. They don’t rewind or examine the past. Instead, we lean forward into the future, short or long-term. What to look for in a Professional Coach. Clients engage coaches based on our experience and knowledge, and especially on trust, integrity, and confidentiality. Certified Profesional Coaches (CPC) undergo comprehensive training and practice in several core competencies as required by the International Coaching Foundation (ICF). Once certified, coaches commit to abide by the rules and ethics set out by the ICF in all coaching relationships. I love to see my clients succeed, so our agreement must be based on our being a mutual fit. Once we’re comfortable with each other, we will outline your plans and set a schedule of meetings that work for you. You remain in control of the process. We cannot evolve if we are not willing to change. Being willing subjects of change or subject to change, we can enhance our lives and our work. *Your personal and professional lives will have to go hand in hand and will influence each other. This is a thought-provoking and creative process, through purposeful and meaningful conversations. When we put our minds to these matters, it is truly empowering. Finding the right coach matters. I look forward to bringing about only positive changes to your life and/or your work, by providing the tools and setting the foundation for learning and results.